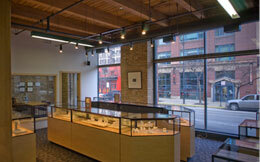 Frequently Asked Questions - Leber Jeweler Inc.
Are you a real jewelry store or just an online retailer? How do I know what size ring to get? What if I order the wrong ring size? Do you offer a discount for members of the United States Armed Forces? What if I forget to pick up my order? What percentage of your profits do you donate to charity? What experience do you have working with ethical issues and the jewelry industry? Are all your diamonds conflict free and responsibly sourced? Should I get rid of my current diamond jewelry if I’m not sure they’re conflict free? Where are your diamonds and colored gemstones cut? Do you sell synthetic or lab created stones? What is your reclaimed gold? How are your metals different than most? Do you sell titanium or tungsten rings? How do I take care of my gold and platinum jewelry? How do I take care of my sterling silver jewelry? I’m a jeweler; can you provide me with your sources so that I can do what you do? We are a real full service jeweler that has been in business for nearly a century as a family owned and operated company. Leber Jeweler Inc, recognized as a long-established leader in the jewelry industry, is able to work closely with trade organizations and industry members on genuine reform. Our extensive gemological training, as well as decades of experience in the gem and jewelry industry, guarantee that we have the technical ability to address any concerns you may have as well as the experience that only longevity can provide. You may shop with confidence at our online store or feel free to contact us via email or telephone and we will guide you step by step through the process of selecting an item from our Earthwise Jewelry® collection. We often have additional designs in our retail store than appear online, and we are always pleased to create a one-of-a-kind custom piece especially for you. If you provide us with a mailing address, we’d be happy to send you a finger sizer. After selecting a size, wear it around for a day as your finger will change in size depending on your activity and the weather. Keep in mind that the wider the ring, the tighter it will fit. Leber Jeweler Inc offers one complimentary resizing, not including shipping, for up to one full size increment within the first two months of purchase on most Earthwise Jewelry® collection rings. Rings requiring more than one full size adjustment will be charged accordingly. Please note that eternity bands can be very troublesome to size, so any size adjustment will entail charges. Engraved rings and those with repeated designs on the shank may require additional charges. In the event you are not pleased with any element of your finished piece of jewelry after you receive it, we are more than happy to work with you further. We want to make every effort to have you satisfied with your purchase of what we believe is the most finely crafted and ethically produced jewelry available. Except for special and custom orders, sale items and other merchandise that has been worn, sized, used or damaged, finished jewelry purchases may be exchanged or returned within 30 days of sale when accompanied by a receipt. Loose diamonds and gemstones sold as individual inventory items may be returned or exchanged within five business days of receipt, provided they have not been worn, used, altered, or damaged. Special orders and custom orders include any designs that we have altered from the original design to meet the customer’s specifications, items that require sketches, special sizes, engraving, etc. While we have always been involved in human rights and environmental issues, in the 1990s we became outspoken advocates for the need to address the conflict diamond issue. Leber Jeweler Inc began to work in partnership with Amnesty International to help raise public awareness. Since that time, we have become actively involved in a range of topics, including fair trade, child and labor rights in the gem cutting industry, Burma and their regime’s control over the gem trade, as well as the impact of precious-metals mining on the environment and local communities. We continue to work with a number of well-respected non-governmental organizations globally. Brian Leber is frequently interviewed by industry-related publications as well as periodicals including the New York Times, Wall Street Journal, and the (London) Daily Telegraph. He is considered an expert in a range of human rights and environmental issues relating to the gem trade and has been interviewed by media outlets including NPR and the BBC. His writings have appeared in journals the world over. Brian frequently lectures to educate the public and fellow industry members on these issues relating to the gem and jewelry industry. We currently offer a wide variety of Canadian diamonds which offer a guarantee of origin assuring you that the diamonds did not come from zones of conflict or offer any financial assistance to armed groups. In addition, our stones come with the assurance that miners earn a living wage and environmental issues are addressed. As one of the first jewelers in the United States with extensive contacts in the Canadian diamond industry, we are able to offer Canadian stones in a broad range of sizes and shapes normally unavailable. Absolutely not. The diamond jewelry we all have purchased before knowledge of conflict diamonds still retains the sentiment and memories from the occasion they were given. The person who meticulously selected your diamond engagement ring was not aware of the issue when the purchase was made. They did so with love and the best intentions — that remains. Can I wear an engagement ring and a wedding band made of different metals? Our 18 karat white gold is 75% gold and 25% palladium alloy. Gold by nature, is yellow in color, so an alloy is needed to make it white in addition to providing durability. Most jewelry is made with a nickel alloy, but we do not use it because it is a low quality base metal and an estimated 25% of the population develops an allergic skin reaction to nickel at some point in their lives. We use palladium, a member of the platinum family, thus creating a higher quality ring of 100% precious metal. White gold is electroplated with rhodium to give it a bright white finish. Over time, this finish will wear, but it can always be refinished. Our platinum is 95% Platinum and 5% Ruthenium, both precious metals and both white in color. Platinum is a much denser metal, so it is more durable and weighs more than gold. On the Mohs scale of hardness, Platinum is a 4 and gold is a 3. We take pride in the design and craftsmanship of our Earthwise Jewelry® collection. However, gold and platinum can scratch and bend, and gemstones and even diamonds can chip, abrade, or become loose under certain circumstances. Using common sense in your daily wear of jewelry will prevent most misfortunes from happening. Insuring higher value items is recommended to cover theft, loss, or extreme damage. You should remove your jewelry when applying makeup, lotions, perfumes, and hair spray, as these can build up on stones and metals, making them look dull and lifeless, possibly harming the stones, and jeopardizing the integrity of the metals. When washing your hands or showering, we recommend removing your jewelry as soap buildup can become lodged under stones, inside rings, etc. Do not wear your jewelry when cleaning, as household chemicals and cleaners can negatively affect metals and gemstones. Swimming in chlorinated water can do irreparable damage, especially if the chemicals were recently changed. In addition, appliances and tools can scratch and abrade. Avoid lifting heavy objects or exercising while wearing your jewelry, in particular, lifting weights or using equipment that comes in contact with your jewelry. On the Mohs scale of hardness, diamond is 10, sapphire 9, glass 5.5, iron 4-5, platinum 4-4.5, gold 2.5-3, pearl 2.5-4, and a fingernail 2.5. We take pride in the design and craftsmanship of our Earthwise Jewelry® collection, however sterling silver can scratch and bend. Gemstones and even diamonds can chip, abraid, or become loose under certain circumstances. Using common sense in your daily wear of jewelry will prevent most misfortunes from happening. Do not wear your jewelry when cleaning, as household chemicals and cleaners can negatively affect metals and gemstones. Swimming in chlorinated water can do irreparable damage, especially if the chemicals were recently changed. In addition, appliances and tools can scratch and abraid. Avoid lifting heavy objects or exercising while wearing your jewelry, in particular, lifting weights or using equipment that comes in contact with your jewelry. On the Mohs scale of hardness, diamond is 10, sapphire 9, glass 5.5, iron 4-5, platinum 4-4.5, gold 2.5-3, pearl 2.5-4, sterling silver 2.5, and a fingernail 2.5.